What is Stop, Start, Continue Analysis? A Stop, Start, Continue Analysis is a proven approach to collecting valuable feedback. Sometime referred to as Stop, Keep doing, Start Analysis - this method is used to collect feedback both at an individual level, as well as, a team level. Individuals will use stop,start,continue to ask peers for feedback on what they should stop doing, start doing, and continuing doing in order to fulfill their objectives. Leaders will often use this method to collect group feedback on how to better an organization. A clear objective is critical to a successful Stop/Start Analysis. For example, "We want to know what we need to stop doing, start doing, and continue doing in order to become the best place to work in San Francisco." 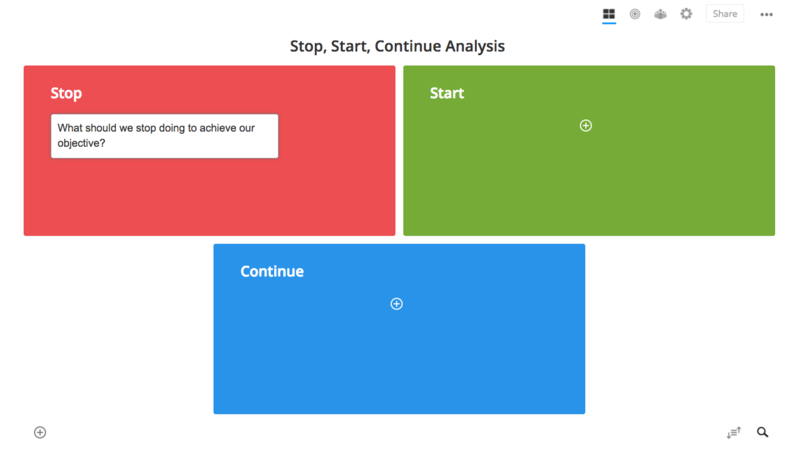 Use this online Stop/Start Analysis TempIate and invite your team to share their input and rate the top ideas. List out as many ideas as your team can brainstorm for each section. Then rate the top items by clicking on the star to float them to the top. When to use a Stop/Start Analysis? For any goal, objective, decision where you want real-time feedback to better understand what's getting in your way, what's needed, and what's working. Get feedback on your products - what's working, not working? This is an excellent tool for analyzing feedback on internal and external processes. Get your customers involved and leverage a stop/start analysis tied to customer service, onboarding, communications.